I forgot to take pictures before I mailed it to her. She was so kind to model it for me and send me a few pictures to post here on my blog. I used the same tutorial at mmmcrafts to make this bag. I increased the size just slightly. I also adjusted the length of the body lining to fit better. 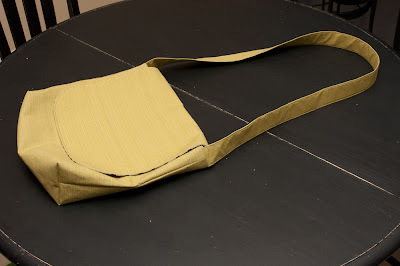 Bag width--With the extra length of the fabric I wanted to make the bag slightly wider. I increased the corner cuts from 3 inches to 3 1/2 inches. 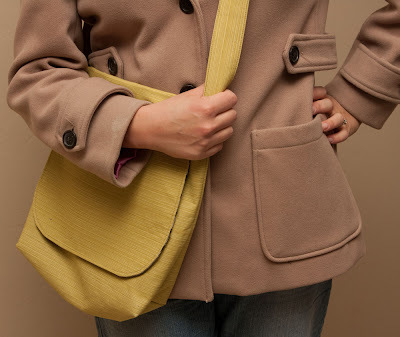 Interfacing tip--When making this bag, I chose to cut the interfacing the same size as the the body and flap cuts rather than following the directions to make it 1/4 inch smaller for the seam. This makes for thicker seams, but I feel like the bag is much stronger because of it. It's not necessary on the pockets though. Change #2--Pockets (I added three additional pockets). The exterior pocket is the same. For the interior I stacked a large and short pocket piece and sewed to one side. I sewed a short pocket piece to the other side. I also added a zipper pocket inside. 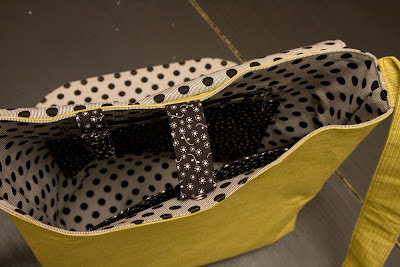 I used this tutorial at Creative Little Daisy to help me put the zipper in. I also put a zipper in my sister's bag (I'll post pictures later). These are the first two zippers I have ever done. I was pretty proud of myself. I wanted something to help keep the bag closed because it seems to gape a bit. I considered a magnetic snap for the flap, but finally decided on a small flap on the top of the bag to come over from the back to front and simple snap. To make the snap closure, first fold in about 1/4 inch of a short end and press so your piece will be approximately 4 x 5.75. Next fold fabric in half and iron so your new measurement will be 2 x 5.75. Fold raw edges in to the pressed center just like you would make bias tape. Press again. Your piece will now be approximately 1 x 5.75 inches. Edge stitch. Add one side of your snap according to your package directions. Add the other side of your snap to the front of the bag once it is completed. Make the key holder the same way. When you add the snap, add one side to the finished end. Add the other side of your snap about 3 inches in from the first side. Make sure your snaps are both right side up and will meet without twisting the fabric. 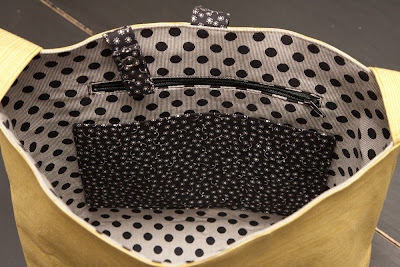 When sewing the bag and lining together, sew the snap closure in the center back of the bag. Sew the key holder a couple inches to the side. 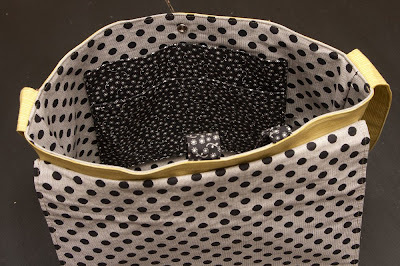 I really love this bag and actually bought enough fabric to make myself one too. The fabric is Authentic by Sweetwater for Moda. After using my bag for a couple weeks now, I doubt I will go back to a regular handbag anytime soon. I love that it's hands-free especially when I'm out with the kids. Even when you are on your own, it's nice to have two hands rather than trying to juggle your bag and your purchases.